A forum for civil debate that promotes progressive alternatives to current challenges and a firm voice for the Patriotic Left. The topic below was originally posted on my blog, the Intrepid Liberal Journal.Is New York’s Eliot Spitzer for real? Is it possible my home state elected a governor who knows what he means and means what he says? Politicians promising reform and boasting about their prowess as culture breakers is nothing new. Spitzer’s predecessor, George Pataki also promised to reform Albany’s corrupt culture and he proceeded to embrace it. Mario Cuomo didn’t embrace Albany’s inside game like Pataki but he didn’t confront it either. To this point, Spitzer reinforces my belief that the Democratic Party’s best hopes for the future reside in state capitals where governors are tackling vital issues such as healthcare, global warming and public corruption. Brian Schweitzer of Montana for example is a sterling example of this new breed. Smart, innovative, tough and unafraid of picking fights with entrenched power to advance progressive ideals. They present quite a contrast to Washington Democrats who even after defeating Republicans convincingly this past November, govern as if they’re afraid of their own shadow. In only the second month of the Spitzer Era, his administration is on a collision course with Albany’s nomenklatura. The spectacle is fascinating to watch. For readers not familiar with New York State politics, Washington D.C. is a beacon of rectitude compared to Albany. New York State Comptroller, Alan Hevesi was forced to resign shortly after being re-elected because of scandal. Hevesi pled guilty to a minor felony charge for using state employees as drivers for his ailing wife. Click here and here to read more about Alan Hevesi and the scandal that forced him from office. As you can discern from the links I provided, Hevesi’s fall from grace was hardly the worst scandal in the world. We’ve seen far worse in New York. Indeed, I rather admired Hevesi’s career both as Mayor Rudi Guilani’s fiscal watchdog when he was New York City Comptroller and his recent stint in Albany. Hevesi also courageously opposed the death penalty as an Assemblyman from Queens. I supported Hevesi’s failed efforts to become the Democratic Party’s nominee for Governor in 1998 and Mayor of New York City in 2001. Nevertheless, what Hevesi did was wrong and Spitzer opted to withdraw his endorsement of the Comptroller prior to Election Day. 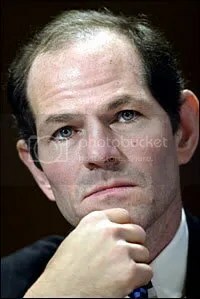 Afterwards, there was speculation Spitzer would not encourage Hevesi’s prosecution. To his credit, Spitzer helped push Hevesi out. Spitzer’s critics believed he should’ve publicly pressured Hevesi to resign before the election. According to New York State’s constitution, Hevesi’s successor must be approved by the state legislature. Spitzer’s fellow Democrats controls the Assembly and have far superior numbers than the Republican controlled Senate. Hence, Spitzer had to deal with Assembly Majority Leader Sheldon Silver. Silver is the embodiment of Albany’s establishment and for over a decade has wielded power as one of “three men in a room” governing New York State. The caucus led by Silver has seen governors preaching reform come and go, as they remained entrenched. Their districts are gerrymandered to their favor as special interests curry their favor. This is not a group easily intimidated by a new governor’s high approval ratings, even if he is a member of their own party. Spitzer and Silver agreed that a new comptroller would be selected from a list of qualified candidates put forward by an independent screening committee. The Assembly favored one of their own, Thomas P. DiNapoli and went along with Spitzer’s plan because they believed he would be among the finalists. He wasn’t and the Assembly opted to renege on the agreement. DiNapoli, a Democrat is well liked among legislators from both parties because of his work to help bail out financially strapped Nassau County. His efforts garnered appreciation from suburban Republicans as well as Democrats and represent the consensus choice inside Albany’s clubhouse. Governor Spitzer also canceled an introductory lunch with Assembly Democrats next Monday, as well as a $10,000 a plate fundraiser for the Democratic Assembly Campaign Committee. Escalating the conflict even further, Spitzer’s aides have let it be known he would criticize the votes of Assembly Democrats in swing districts where Republicans could make inroads. One can’t help but admire Spitzer’s pugnacious tenacity on behalf of principle. He used the same approach as State Attorney General when he prosecuted corrupt brokerage houses on Wall Street ripping off the middle class. Spitzer’s unwavering pursuit of corruption propelled him to the governor’s mansion. However, being governor is far different then serving as the king of your own fiefdom as New York’s top lawyer. Governing is about achievement. Achievement requires consensus. New York’s legislature appropriates funds and their cooperation will be required to pass budgets on time and enact Spitzer’s agenda for health care reform, education investment and restructuring New York’s finances. Also, Spitzer’s budget calls for unpopular cuts with New York’s hospitals and making the tough calls can’t help but diminish his popularity. Albany’s nomenklatura will likely play a game of rope-a-dope and wait for Spitzer’s popularity to dissipate so they can cut deals from strength. Gridlock appears unavoidable unless Spitzer adopts a more conciliatory tone. Perhaps we New Yorkers have a ringside seat to history. Hopefully, we’ll also have a better state when Spitzer leaves office. This entry was posted on Sunday, February 11th, 2007 at 3:27 am and is filed under Uncategorized. You can follow any responses to this entry through the RSS 2.0 feed. You can leave a response, or trackback from your own site.